Are You Booking Ready ? 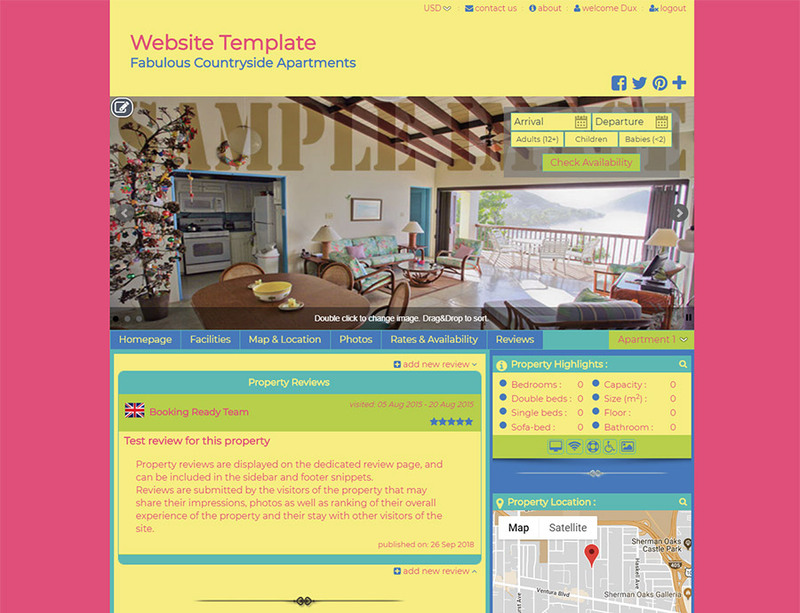 Create a website for your rental property in a minutes that will look great on every PC and mobile device. No technical skills required + Free hosting included ! 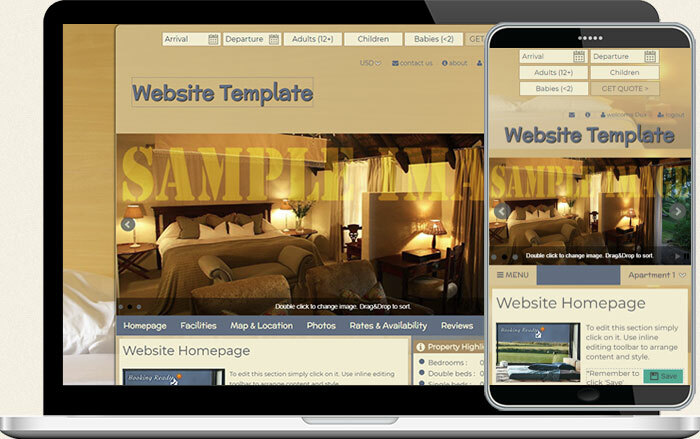 Whether you are single or multiple rental property owner, like apartment(s), guesthouse, villa(s)... even a single room or entire resort, our beautifully-designed website templates come packed with features specifically tailored to jumpstart your booking prospects instantaneously. 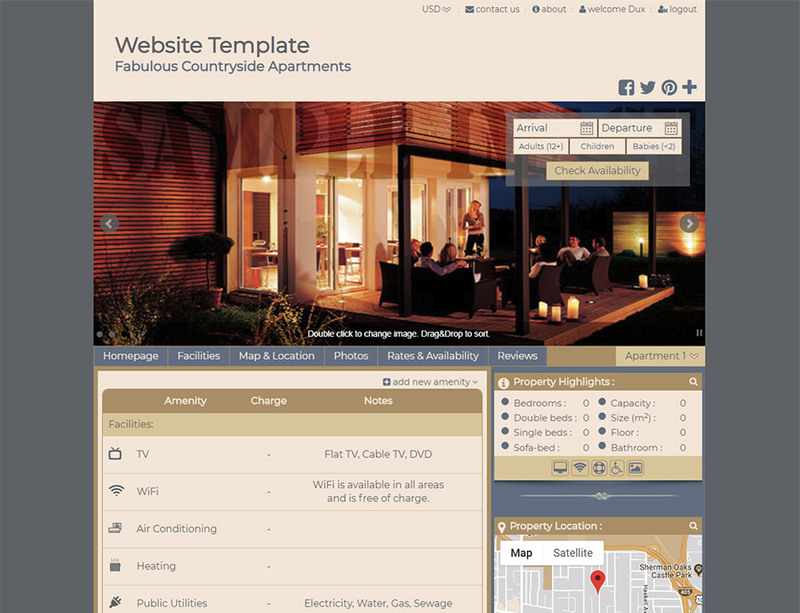 Showing off your property’s best amenities is a great way to personalize your website. 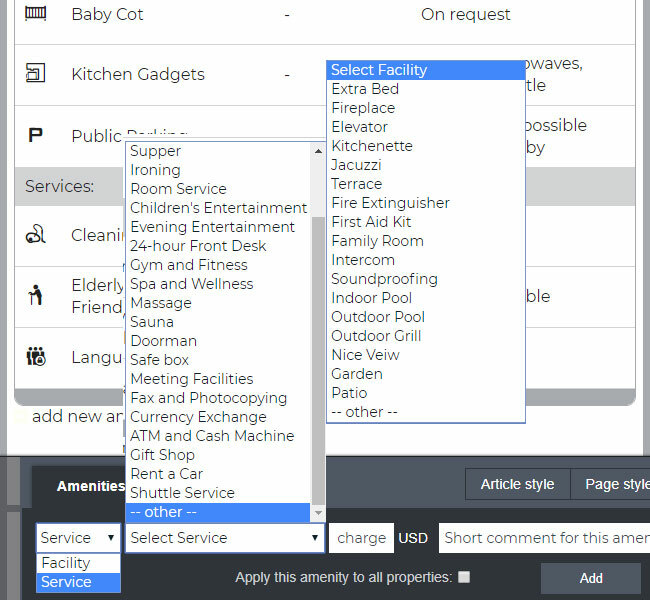 While on your Property Features page use Amenities & Services edit panel to simply manage all the amenities and services for your property, or multiple properties at once. You can add or remove features from the predefined list or you can simply create your own custom feature. For each item, you can define a charging fee if any, that will be automatically calculated for each subsequent booking for that property. Just add a standard rate for your property and you are all set. 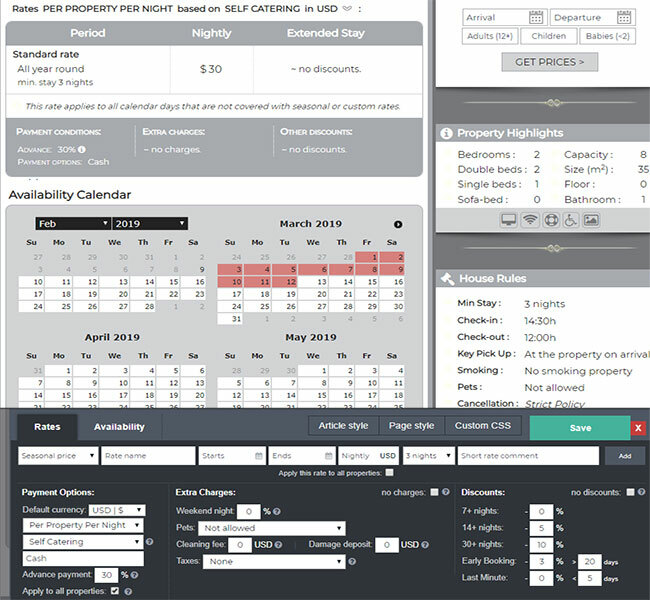 If you wish to set up your quotation and availability strategy in more detail, by simple double click anywhere on the Rates & Availability page you will be presented with a full set of options. From there, you can define additional seasonal or fixed rates, various payments options, optional extra charges and discounts, that will all reflect the total booking price for your future clients' queries. 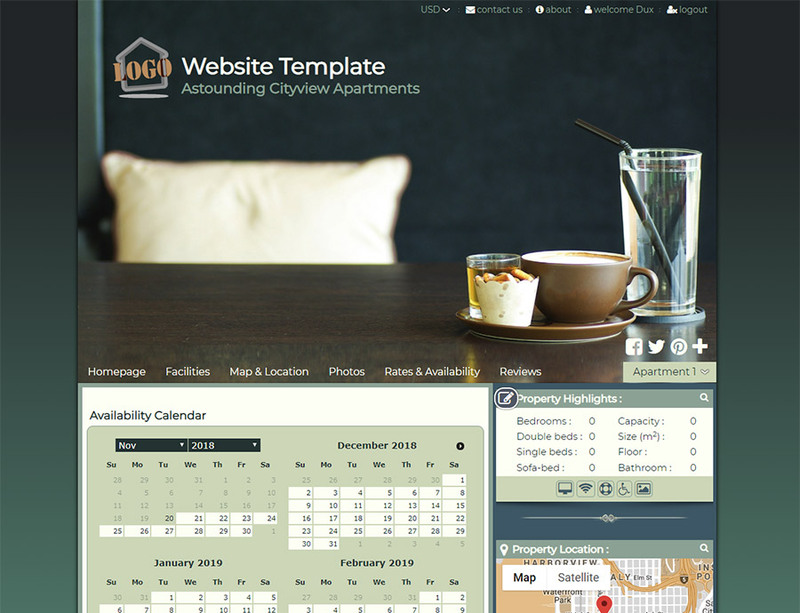 With your Booking Ready website launch, you are all Ready for Bookings :) as our service comes with a fully charged booking engine under the hood. Visitors may conduct comprehensive on-site inquiries and get all necessary information about quotation in any desired currency, as well as the availability and conditions following your policies. 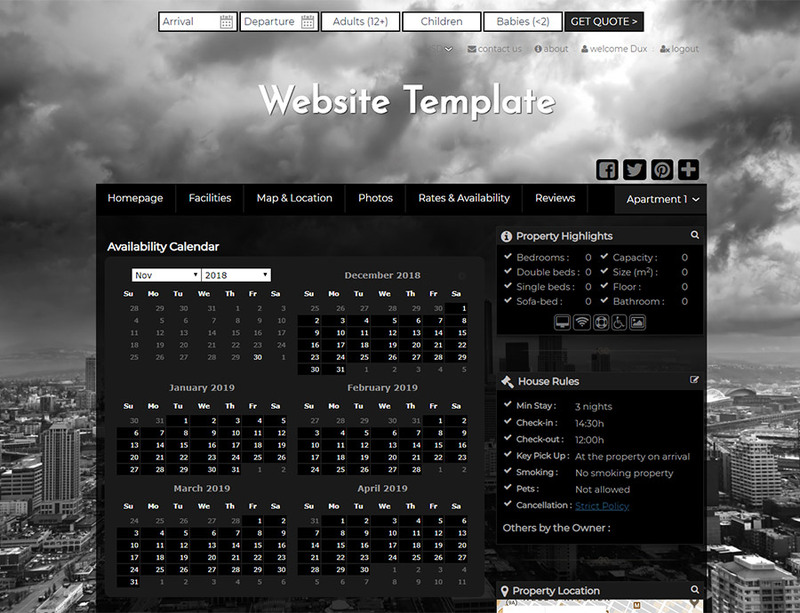 They can send you booking queries directly and once you negotiate all the details, they can book your property online. 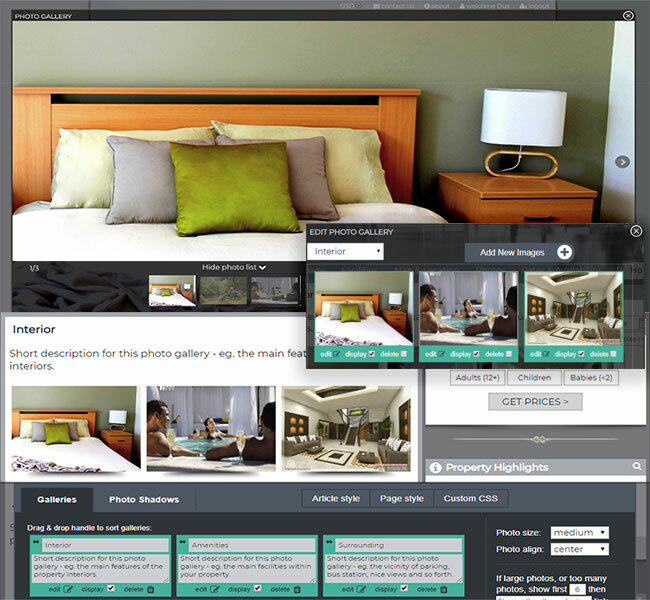 Adding single or multiple beautiful image galleries to your website couldn't be simpler with the Booking Ready interface. 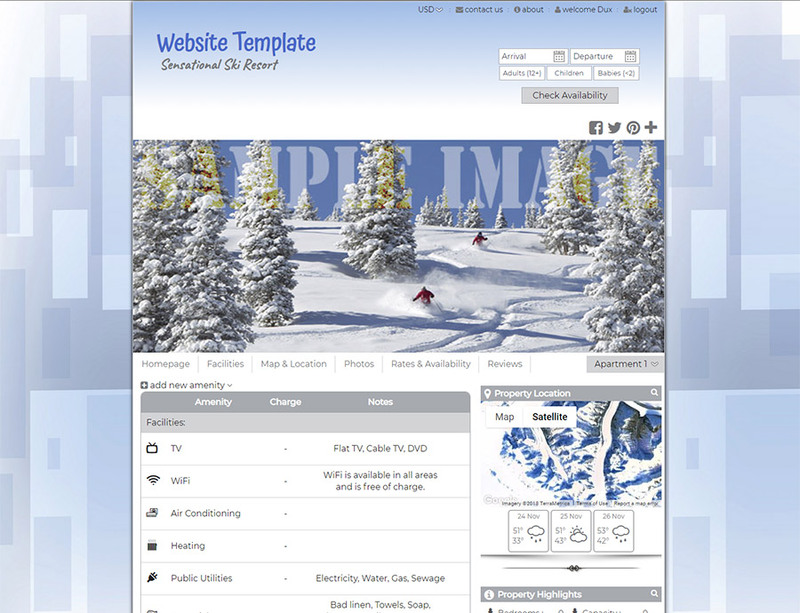 All you need to do is upload your images, choose what type of gallery you wish to create and you'll be up and running. 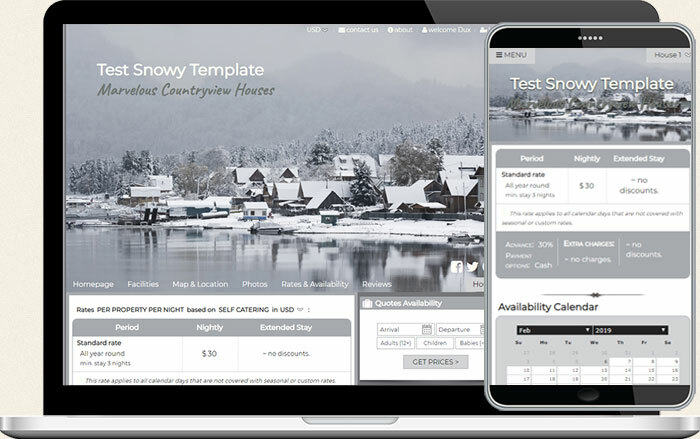 Optionally, you can provide each gallery name and a short description, and adjust the display style and layout to showcase your images and keep your visitors interested. Include Google Maps on your website to show the location of your holiday let, allowing visitors to get directions, and see nearby attractions. 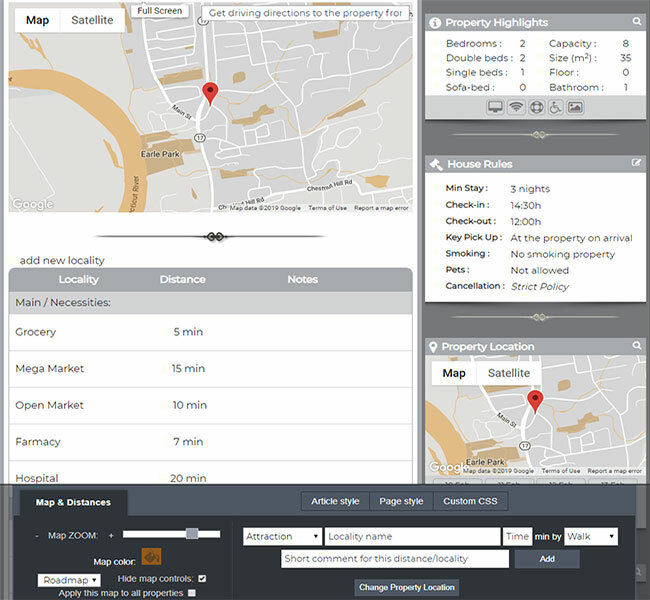 You can customize your map's controls and magnification, choose between satellite and roadmap layout, even set up the map's colour to best fit your website theme. 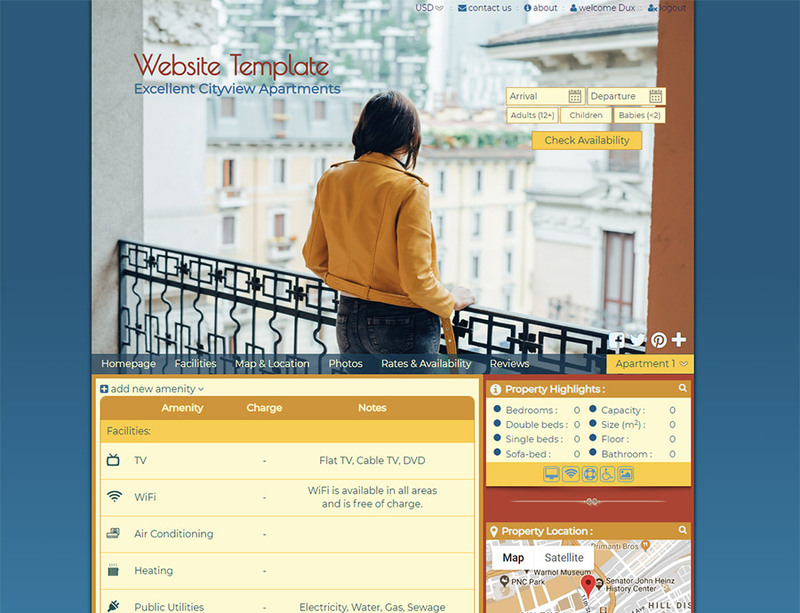 In addition, you can choose from the predefined set of local services and attraction types, or easily set up a custom one that will make your site look really professional. 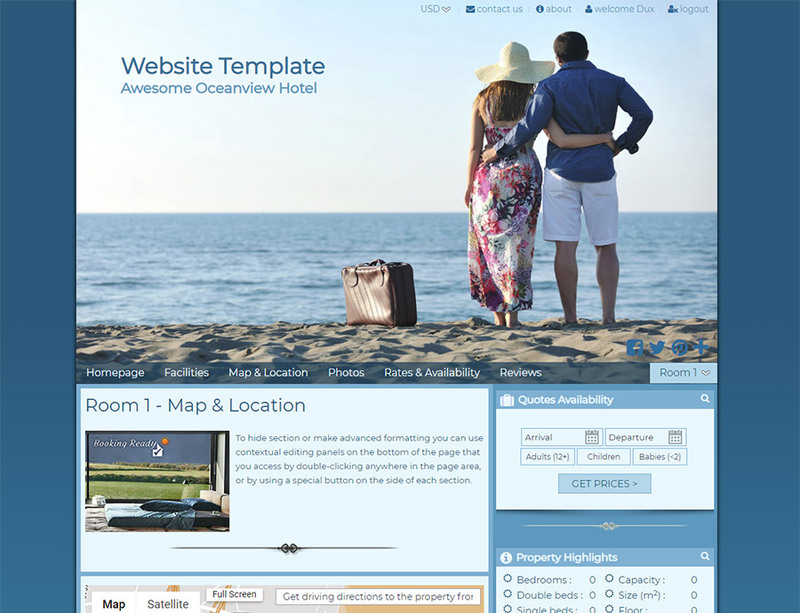 Allow guestbook on your website so potential guests can read previous visitors comments, and add their own reviews and ratings. Off course, you have full control over what's displayed and what’s not. There's no better recommendation for your holiday rental than some inspired great reviews from your satisfied guests. 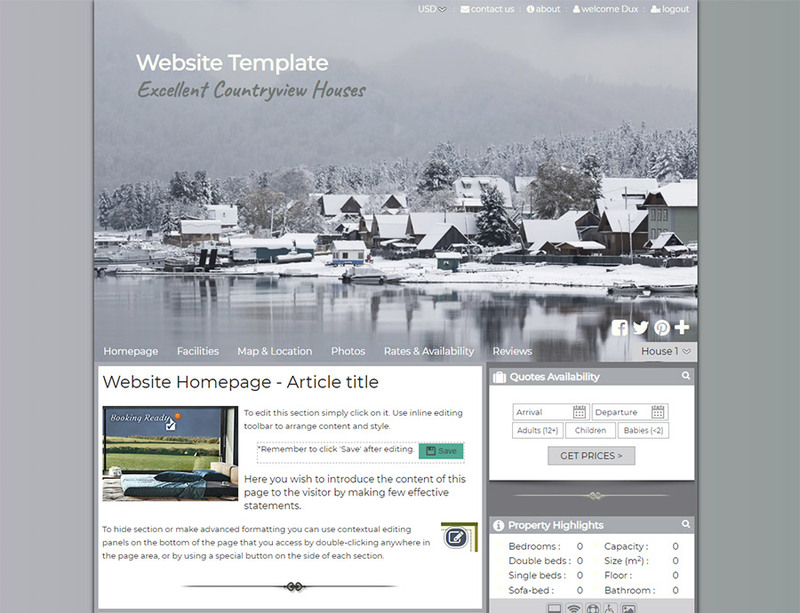 Just a few mouse clicks and you can add new custom pages, or edit text, photos or any other type of content for the existing ones by using simple content editor. Just paste the YouTube address and voila, you have added your property video. 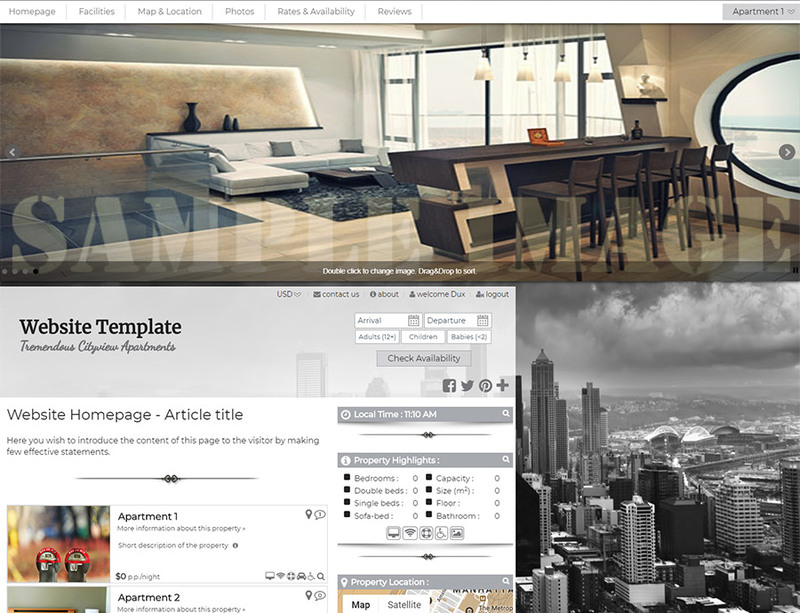 Why stop there, drop the property floor-plan, brochure or any other type of document for your visitors to download. While I am not an expert, I have found it fairly easy to navigate, find the info I need and set my site up quickly. On top of that, the folks at BookingReady have been quick to respond to my inquiries. Thank you! I have had tremendous assistance and help from the BookingReady support team. They have responded to all my enquiries promptly that it has been almost unbelievable to have obtained such instant help. 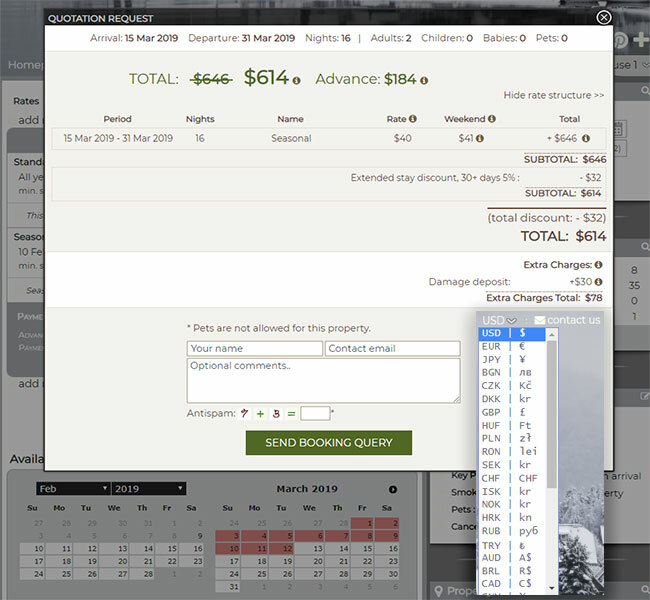 BookingReady is a great tool. It's very easy and simple. Even at the beginning, we had no trouble learning how to use it. We've been getting more inquiries from clients since we created a website. 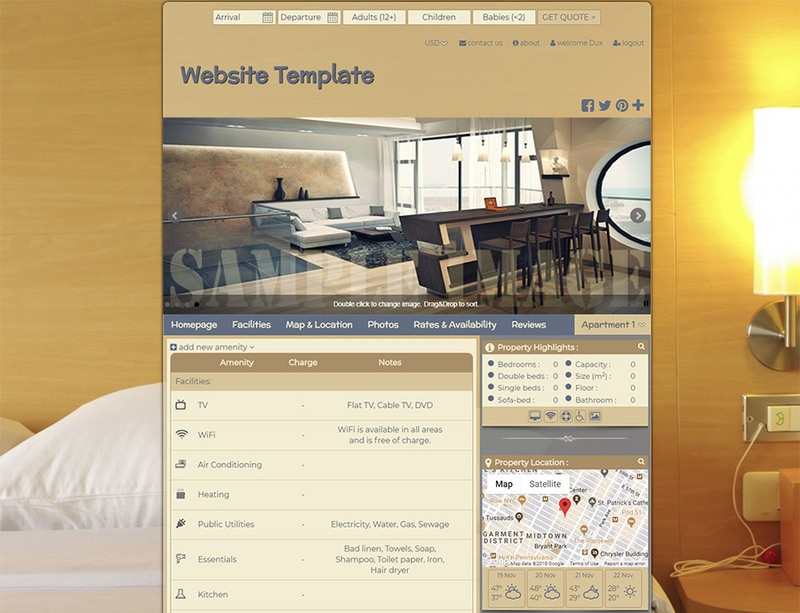 From creating to operating the website, BookingReady made everything so simple and easy. 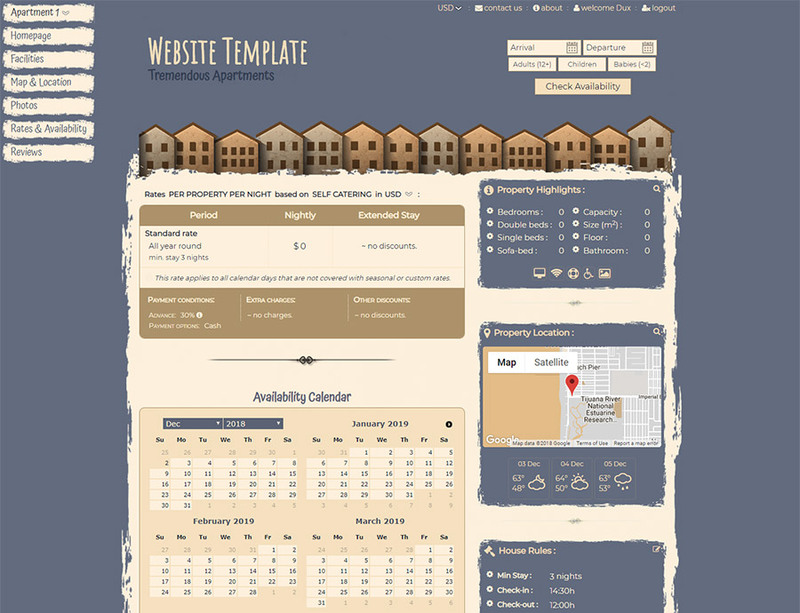 We also purchased the website builder which made it even easier for us to jumpstart. Thank you so much! 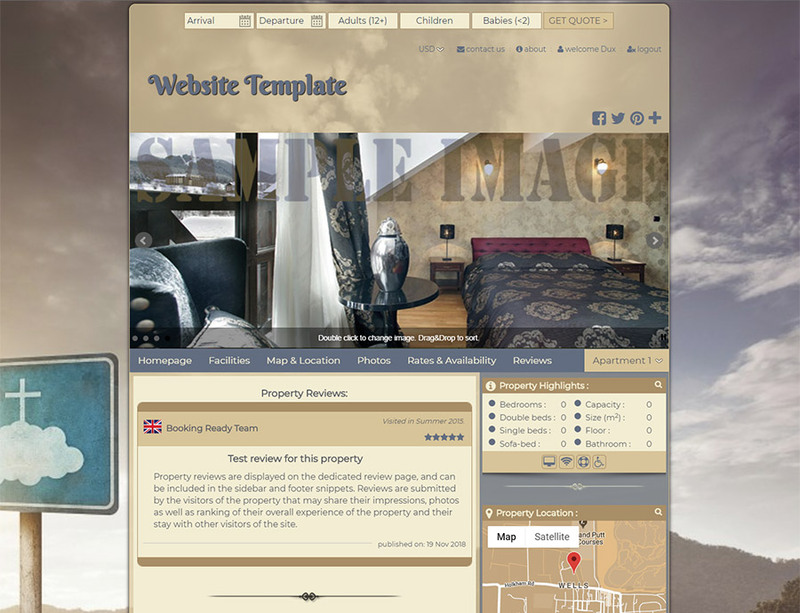 The templates were easy to use and the BookingReady Support staff were so helpful and quick to respond to any inquiry. They even went so far as to fix things for me...Thanks ! 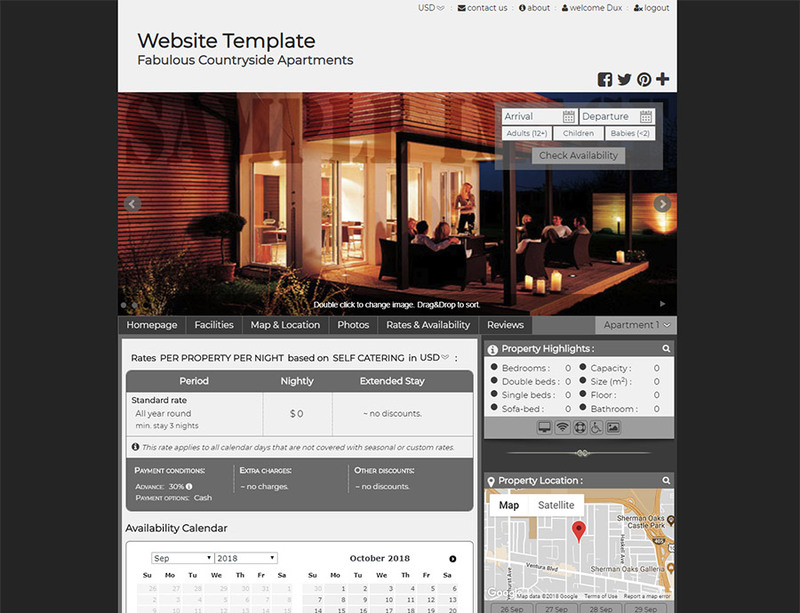 Booking Ready main idea is to let you make your property rental website effortlessly. Even more, to enjoy all the way while feeling comfortable to experiment with numerous options and features until you are quite happy with the results. 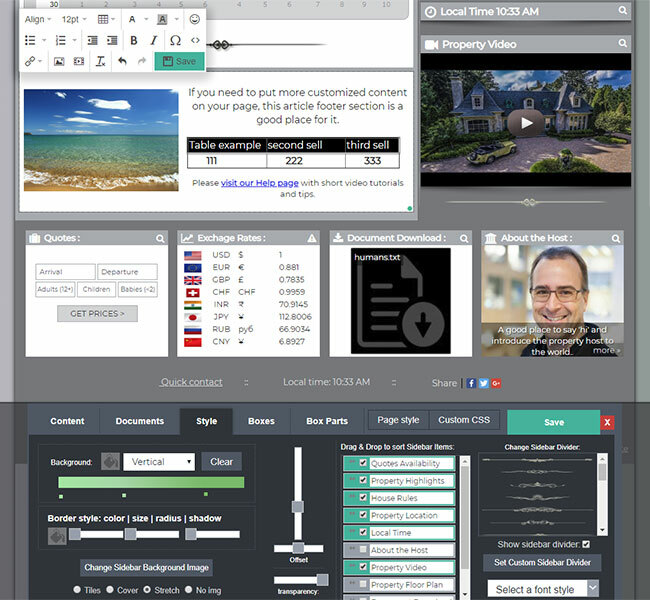 You can customize almost endlessly your website design, layout and features just by manipulating with interactive sliders, colour pickers or simple content forms elements. 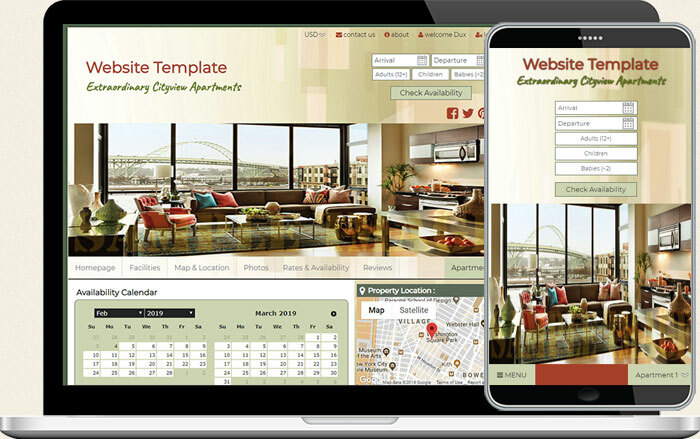 Because it is the easiest, the simplest and the fastest way to get a professionally designed website fully optimized with just property rental owners in mind. 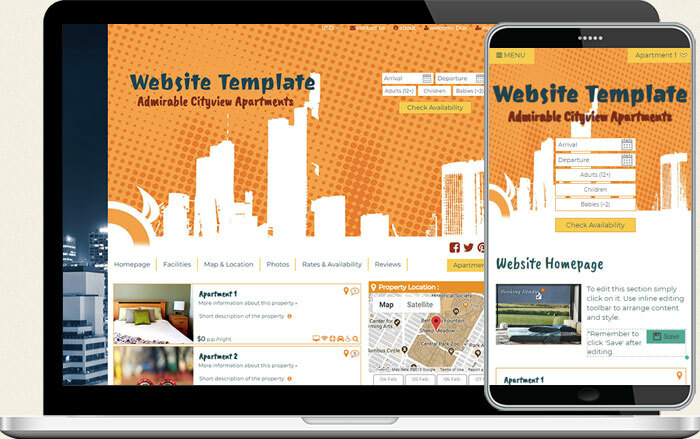 No need for expensive third-party web design agencies or universal web site builders cluttered with unnecessary features, no need for any technical skills related to your website design, hosting or mobile rediness and search enignes visibility. 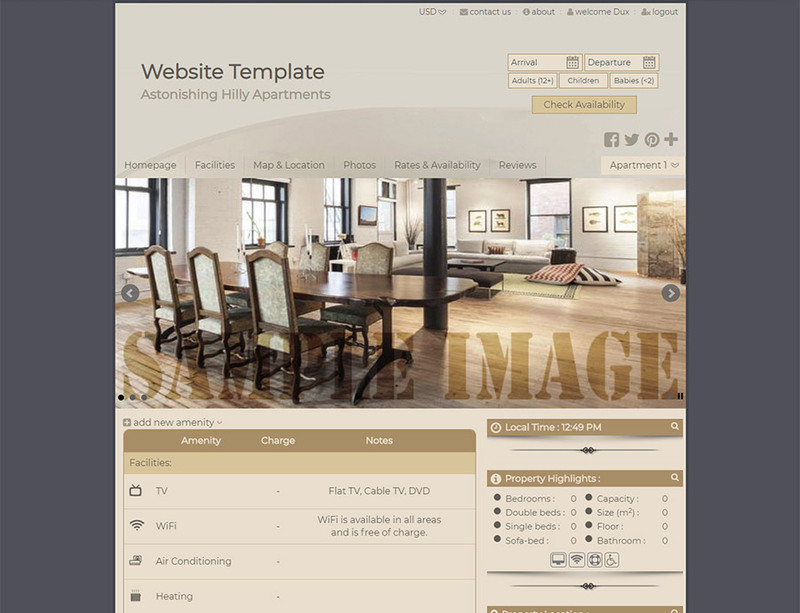 Not only is everything you need included, but you have total control over your site at all times. Research on rental booking preferences has revealed that 65% of guests prefer to book directly with the provider rather than using listing sites like Booking.com. 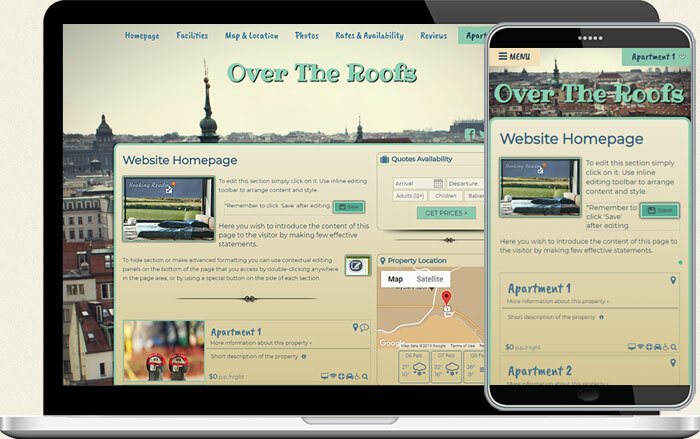 By having your own website you’re free of paying fees to those services, becoming more self-sufficient and take control over your vacation rental business in order to boost your bookings. If someone is interested in your property, you really don't want to send them to a third-party listing. 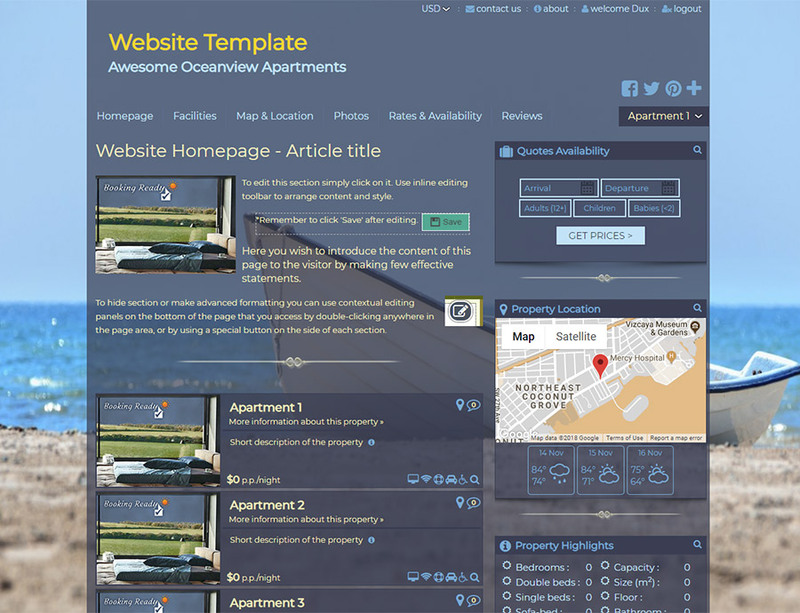 That’s why a website is an absolute essential for any serious vacation rental business owner looking to create online credibility. 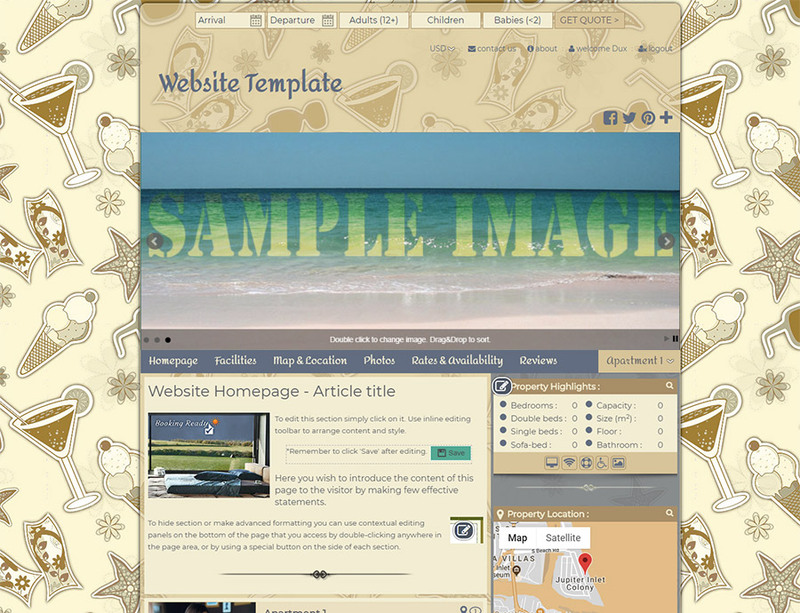 With your own website, you can advertise anywhere. 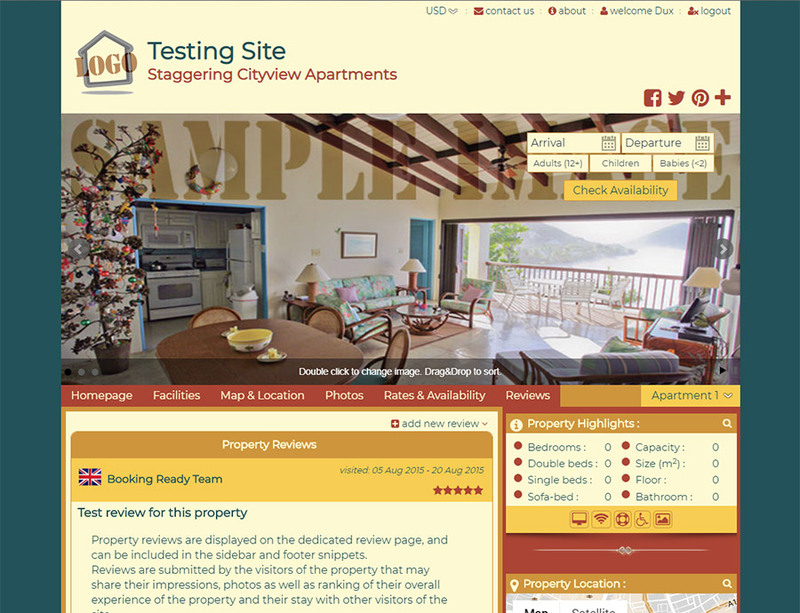 Appear in internet searches (through Google, Bing, Yahoo etc) when someone is looking for a holiday rental in your area. 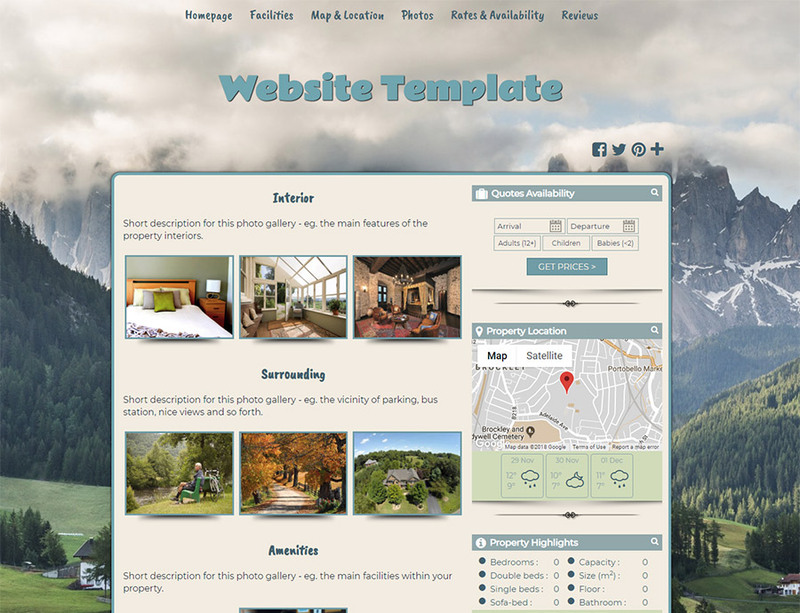 You can easily expand your marketing reach by promoting your holiday property through Social Media sites, send traffic from social media profiles, directories and forums to your site. Increase exposure - Having your own vacation rental website allows you to be 100% in control of the content that is published on it. No matter what you want to put on your site: more text, photos, videos or documents for dowload, there are no restrictions which will limit your decision making. 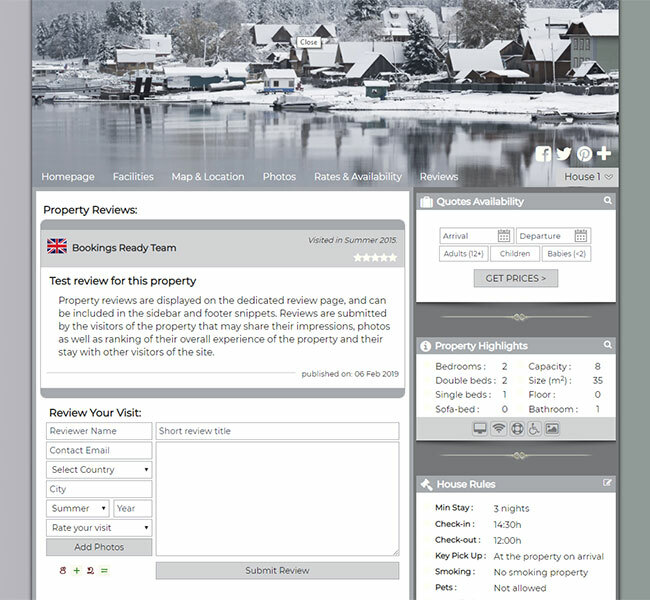 Not to mention that with BookginsReady.com you get all these benefits in one slick package, specially designed for holiday rental owners like you. 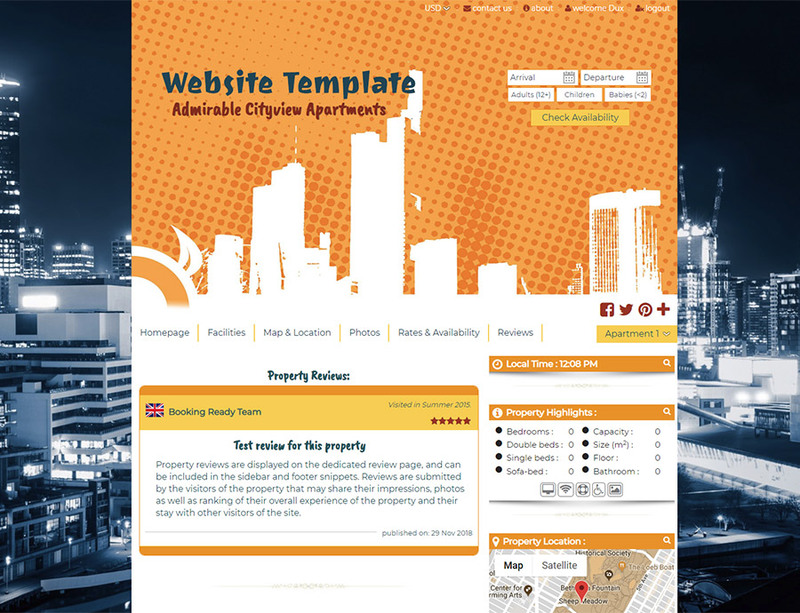 After completing the registration form, and providing you website/property name, type and location, and choosing your preferable template you will end up on your website homepage in a matter of minutes. 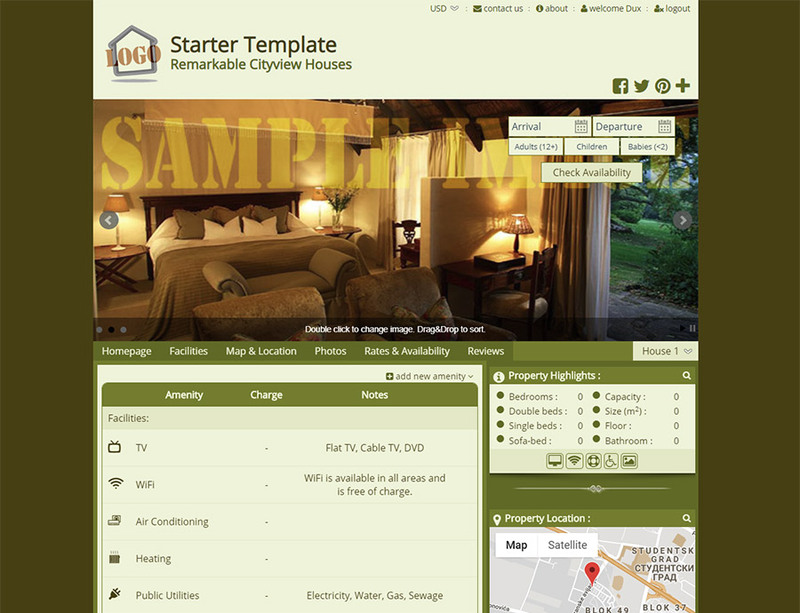 A few more for adding photos of your property, nightly rates and a description and you will be ready to schedule bookings and receive payments. 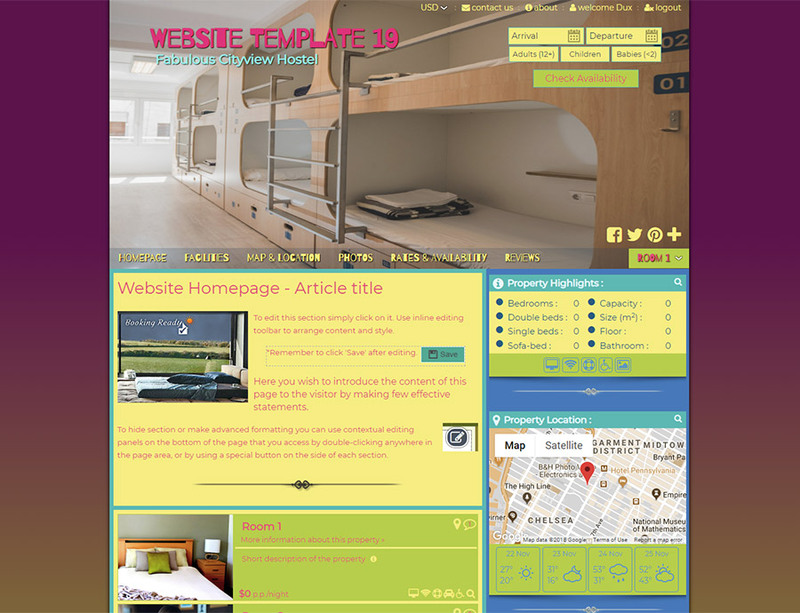 Before publishing your website, you may wish to play around with intuitive interface controls and adjust your existing theme's design by changing any element colour, size, position or visibility - even the current theme itself. No technical skills are needed to build your website - our intuitive website maker guides you through the process step-by-step. 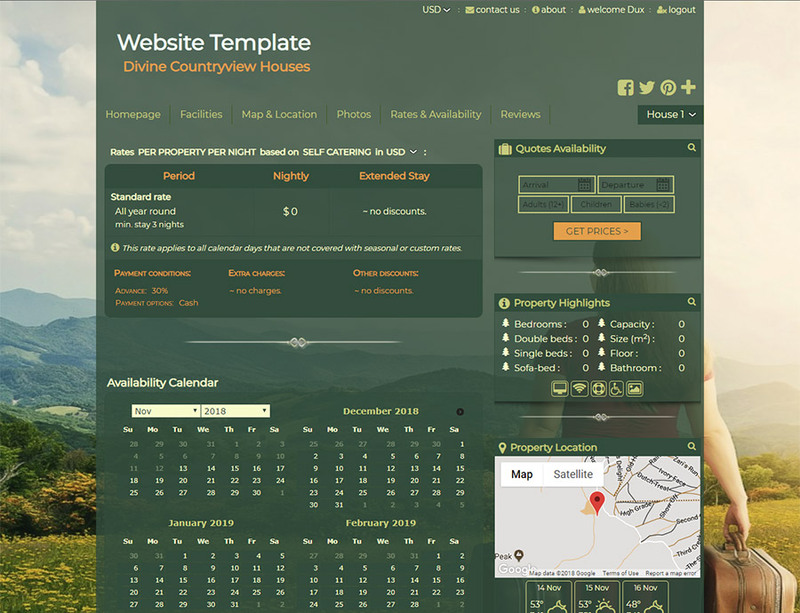 If you sepcify Serene Mountain Lodge as the name of your Property/Website in the registration form, the name of your website by default will be serene-mountain-lodge.bookingready.com. If you opt for one of the paid plans, you can use your own domain if you already have one. Once you choose your website name and register it with BookingReady.com you can't change it, nor your url address. Yes. Through the integrated booking form and booking query form, people can send you an enquiry about booking dates, entering the dates they wish to make a reservation for. From your Booking Ready account, you can review and convert this to a booking, blocking the dates out. Each paid plan comes with three email addresses: office@websitename.tld, info@websitename.tld, support@websitename.tld. 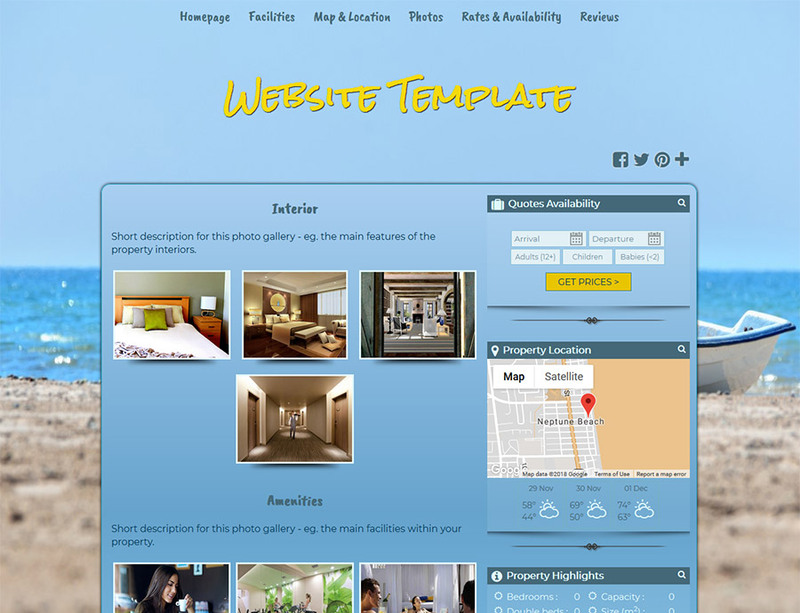 You need to have your dedicated domain name attached to your Booking Ready website. You can set up additional email addresses for a one-off fee of USD5. 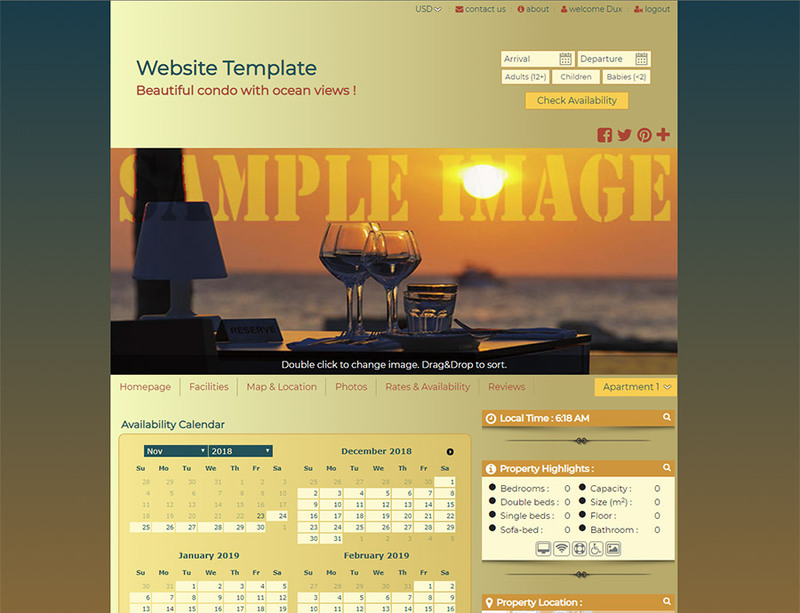 With your free plan, you can set up only your private email address to be used with your Booking Ready website. However, It doesn't affect your website functionality by any means. We at Booking Ready make sure that your website will be fully visible to all search engines, including Google. 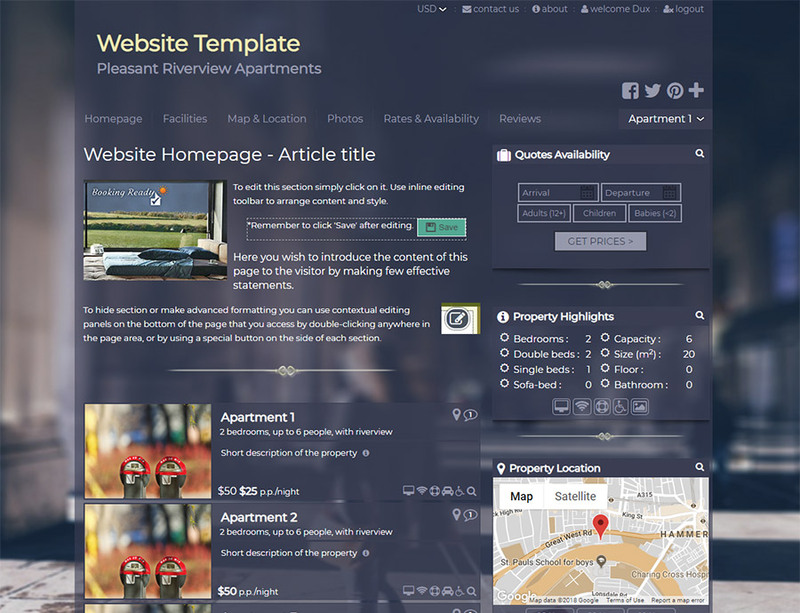 All elements of your website will be set up following the best SEO practices, especially when it comes to the Property Rental market requirements. It is one of our major competitive advantages, that we’re proud of. Yes. Once you are logged in to your account, you can modify, update, add and remove content as many times as you like, whenever you like. When you are satisfied with all the changes you made, you need to re-publish your website by single-click for your updates to be visible online. 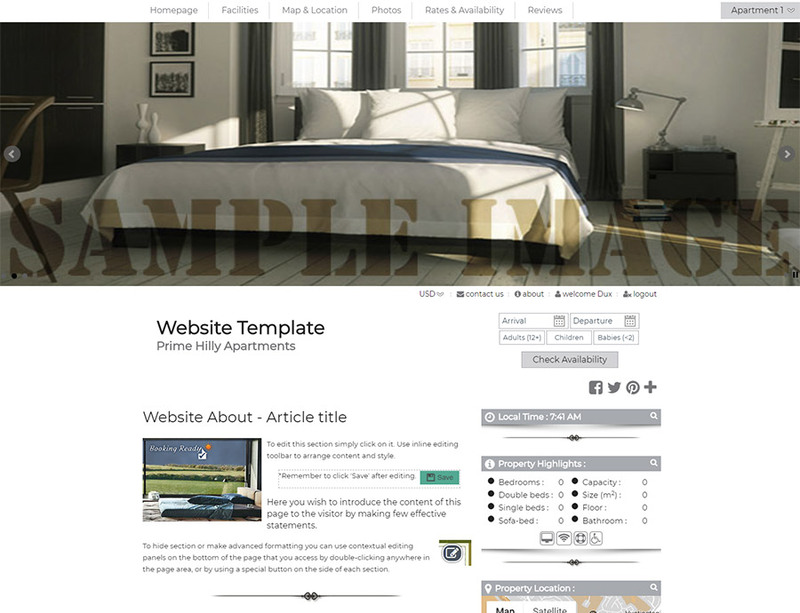 You can leave your website creation to our professional team for a one-off fee of just USD95 (for single property, plus USD15 for any additional). 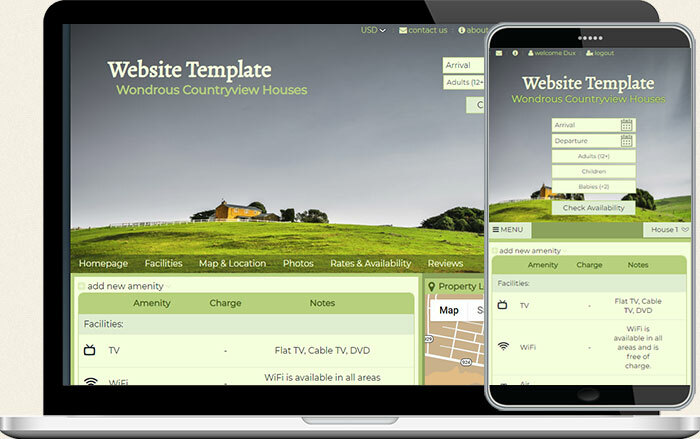 We will contact you for the property information and photos, or you may simply give us the link to any existing website and/or listing site adverts if you have them. 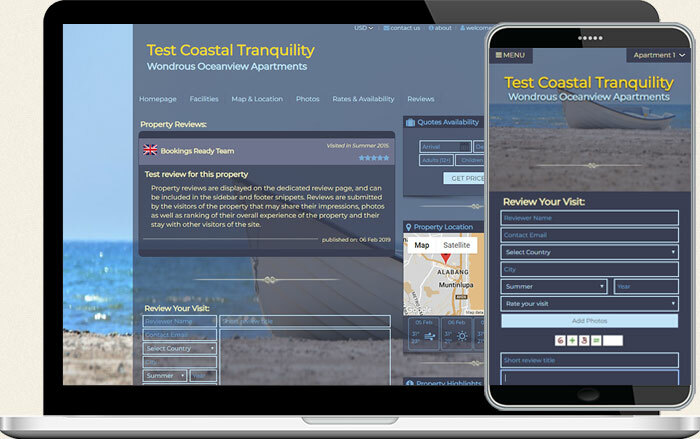 Once we've received everything we need from you, we'll create your new holiday rental website within 5 working days. 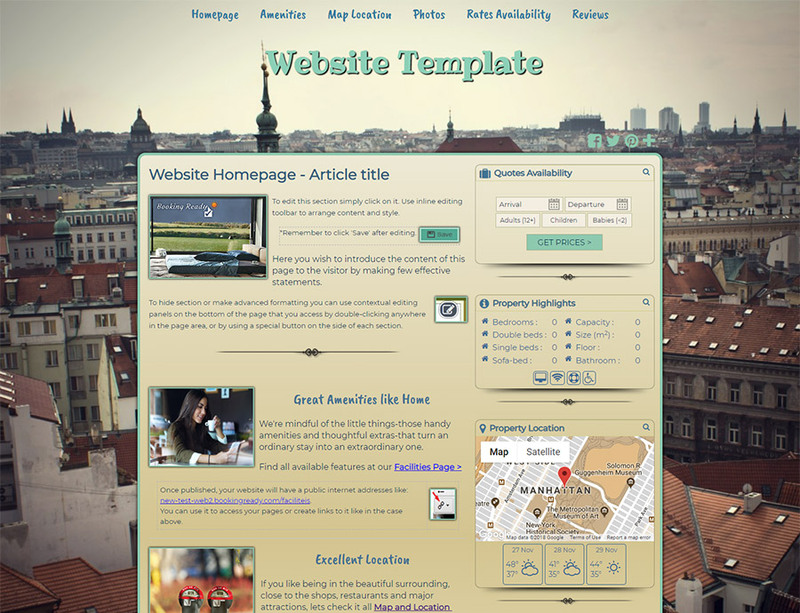 Yes, our free plan comes at no charge and includes web hosting and all features out of the box. No payment, no trial, no commitment. We may display a discrete Google add on some pages, but even this feature is restricted only to those free Booking Ready websites that are older than 6 months and already have significant traffic. No, there are no hidden costs. 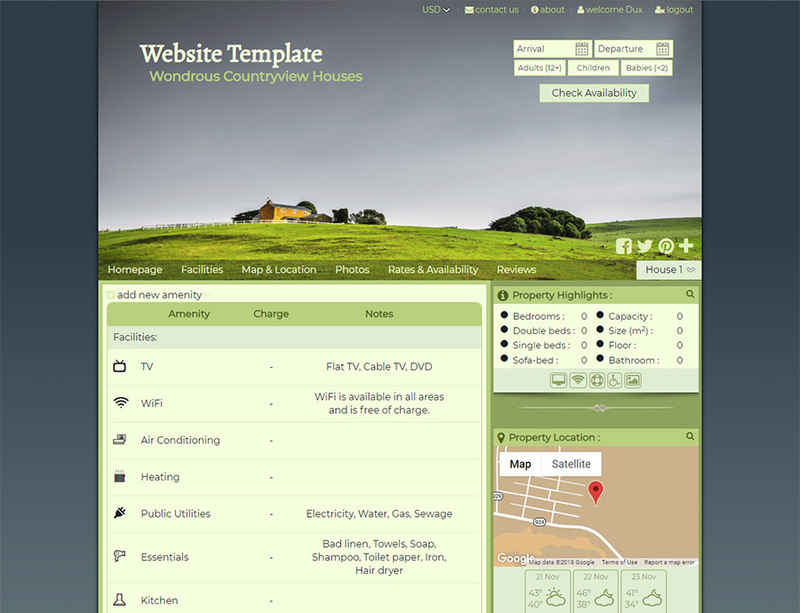 There are no setup fees for your website and no fees for additional functions. Your plan has everything included. There are always users that wish more from their website. If you want to connect a custom domain or transfer your old one to our platform > or you are a professional user with multiple rental & commercial properties or even wish to set up multiple websites for each under your account > or you wish to use our professional SEO services to promote your Booking Ready website > or you just wish to get 24/7 priority support, you can choose between our extra affordable paid plans. 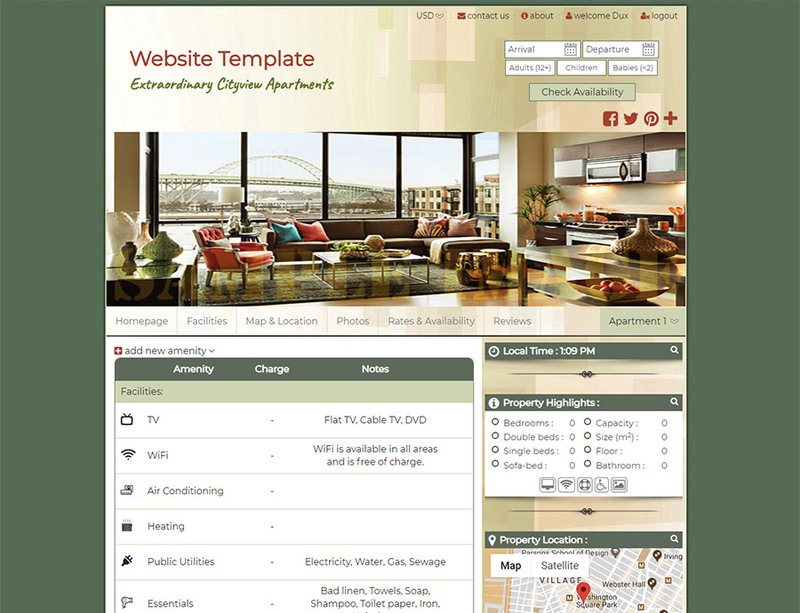 You can use your own domain name for your Booking Ready website as a part of any of our paid plans. You will need to use the control panel for your chosen provider to direct the domain name to our host company's domain name servers, or ask the provider to do it for you. Instructions differ between providers, but we will happily help you through this process if needed. Currently, Booking Ready provides the management side of bookings but not payments. We're planning on adding payments via your Booking Ready website in the near future. If you'd like to be involved with this and gain early access please contact us. If you wish your Booking Ready website to be cancelled (which means not online and not visible on its internet address), you should contact our support at support@bookingready.com with the cancellation request and short explanation. If you are using our free service, your website will be removed in 5 days after the request date. If you are on paid plan, you should cancel your subscription up to 30 days before your next billing date. No. Just leave it all to us! 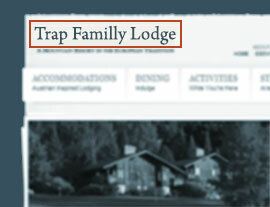 This is the title of your website, showing in the top header. You can easily change it subsequently as well as all other parameters of your website. 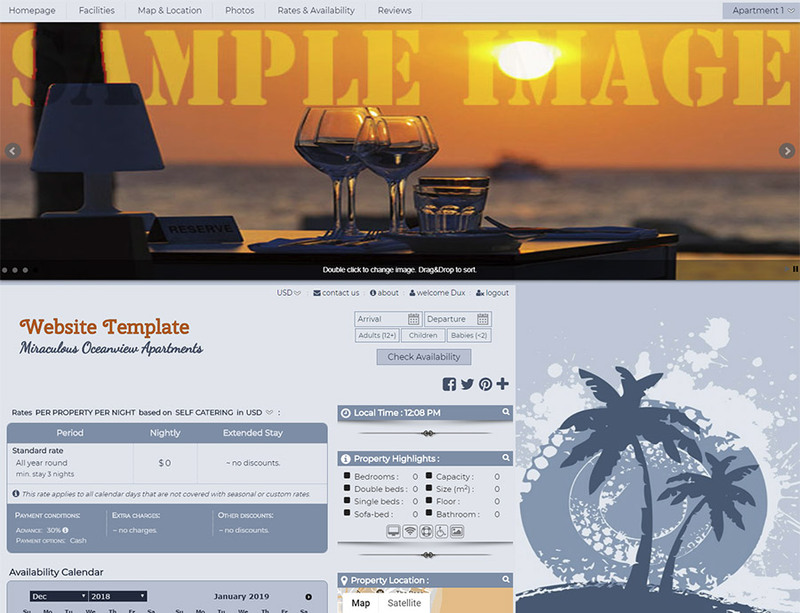 * You can fully customize any template to look any way you want using our easy-to-use editor. 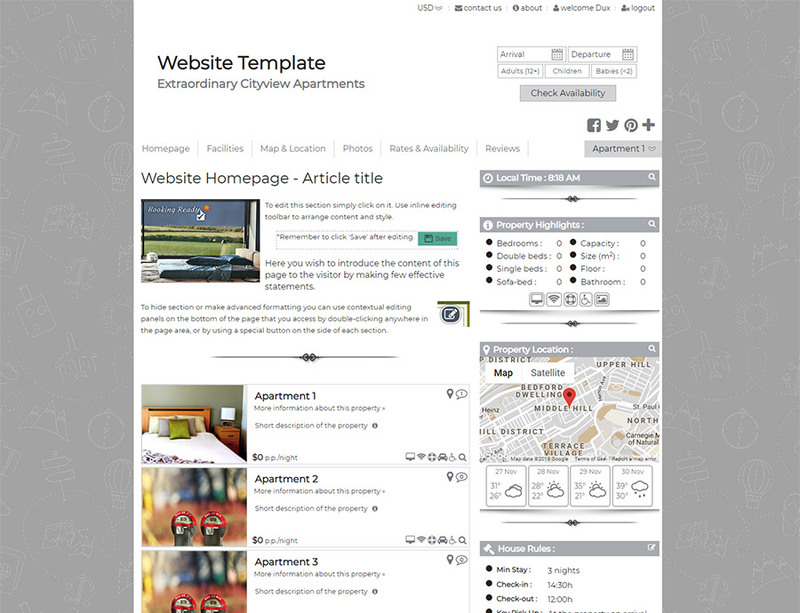 You can even switch between different templates at any time during your site creation process. as some email clients treat any automated email message as spam.